The Fulton County Community Foundation (FCCF) awarded a planning grant of $34,425.00 to The Times Theater, Inc. in support of their efforts to revitalize the theater in downtown Rochester. Plans to restore and revitalize the Times Theater were made in conjunction with the City of Rochester’s Main Street Revitalization Plan. This plan was formed in 2016 to promote a vibrant downtown and to establish Rochester and Fulton County as a great place to live, work, learn, and play. In the plan, the Times Theater was named a critical cultural and social asset within the community. 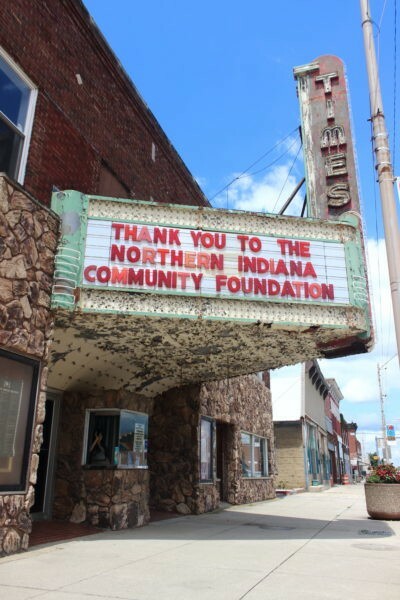 A revitalization committee for the Times Theater plans to restore the theater as a community center for the arts. Their goal is to inspire interest and participation from the community to revive the building as a place for film, art, theater, and music that can be appreciated by all, and to stimulate activity and growth in the downtown area. The grant from the FCCF will cover the costs for the engineering and design plans. The group aspires to obtain plans that will build on the historic character of the theater building and will return it to its former prominence. From left to right: Representing the Fulton County Community Foundation, Jay Albright and Brian Johnson. Representing the Times Theater, Renee Frenger, Julie Sutton, Lizzz Honeycutt, Brian Walsh, Christine Walsh, Nick Sayger, Phyllis Dausman, Tanner Lee.